Are you looking for an affordable fish finder/GPS unit that is easy to use? Look no further than the Raymarine Dragonfly 5PRO. The Raymarine brand is synonymous with light commercial and recreational saltwater market. In 2013, they launched their Dragonfly series of fish finders and GPS plotters. 2017 marked the launch of a great product to follow up their success, the Dragonfly 5PRO. The 5PRO makes it easy for both professional and recreational anglers alike to enjoy the amazing benefits of an affordable fish finder that is packed with exciting features. Whether you’re in Canada or the US, fishing a small lake or a large body of water, angling for dinner or that trophy catch, the 5PRO is an excellent product. The sleek design, large screen, WIFI, mapping abilities, advanced sonar and the simplicity of use, the Raymarine Dragonfly 5PRO is so much more than just a fish finder. The Dragonfly multifunction displays are built on simplicity. There are only 4 buttons and one control pad on the new Dragonfly, doing away with previous dials and joysticks. The menu system is designed to be no more than two trees deep, so that a user has the most intuitive use of technology. The Dragonfly units are all waterproof to the IPX6 and IPX7 standards. The screens are an optically bonded LCD technology that offers both bright and high contrast that perform well even on the sunniest of days. The display offers sharp color and contrast and are guaranteed not to fog up in the cold or rain. The unit is also designed with ease of installation in mind and uses a convenient ball and socket mounting system. The Raymarine Dragonfly 5PRO features a sonar which uses wide-spectrum CHIRP technology and a DownVision sonar running at the same time so the head unit is capable of displaying both sonar signals. This helps interpret the bottom, structure and detail in the water with better accuracy. Both recreational boaters and anglers alike will find this technology and the sharper images helpful. The sonar in the 5PRO can deliver sharp signals to a depth of 600 feet for DI and 900 feet for CHIRP, whether in fresh water or salt water. The company guarantees against fogging. The Dragonfly 5PRO is one of the first units on the market that allows a user to stream sonar right to their smartphone or android device. Technically what the 5PRO is sharing is its sonar signals, so this information can be sent to your smartphone or tablet. There are currently two apps on the marketplace that can take advantage of WIFI in the 5PRO. The first is the WI-FISH app that shares your sonar data directly to your phone or tablet. The second is the Navionics Boating App where you can create your own personal bathymetric charts with incredible 1’-0” contours. You can literally stream sonar right to your phone. Raymarine has partnered with some of the best cartography companies in order to give buyers a choice of mapping technology. You can choose to have maps preloaded, or purchase prepackaged maps from Navionics, C-MAP by Jeppesen or Raymarine Lighthouse. Two vital features on any map are the ability to set tracks and waypoints. Tracks are just as they sound. They are like a string track of where you have been on the water from the time you turn the unit on until the time you stop tracking yourself. You can have multiple tracks, each containing up to 10,000 points. Obviously this can be incredibly helpful in learning a lake or just in finding your way back to your starting point. Large bodies of water are easy to get turned around on so many people want the string feature so they can trace their route. The second feature of importance is the ability to set waypoints. Waypoints are important spots on the map that you can identify with an icon. Want to mark an important hidden reef, underwater island or just a fishing hotspot? It’s easy with the Dragonfly and you can split over 3000 waypoints into up to 100 groups or categories. The Raymarine Dragonfly 5PRO is truly one of the most simple-to-use multifunctions in the marketplace. The ease of use starts with Dragonfly’s single cable hookup to the head unit. The Dragonfly 5PRO is plug and play from that point on. One single button push pulls up a menu with icons and descriptions of which screen you would like to use or a series of combo screens between the different sonars and mapping. Fewer buttons mean less confusion. The whole unit was designed to be easy to use so that you don’t have to spend days trying to figure out how to work your technology. 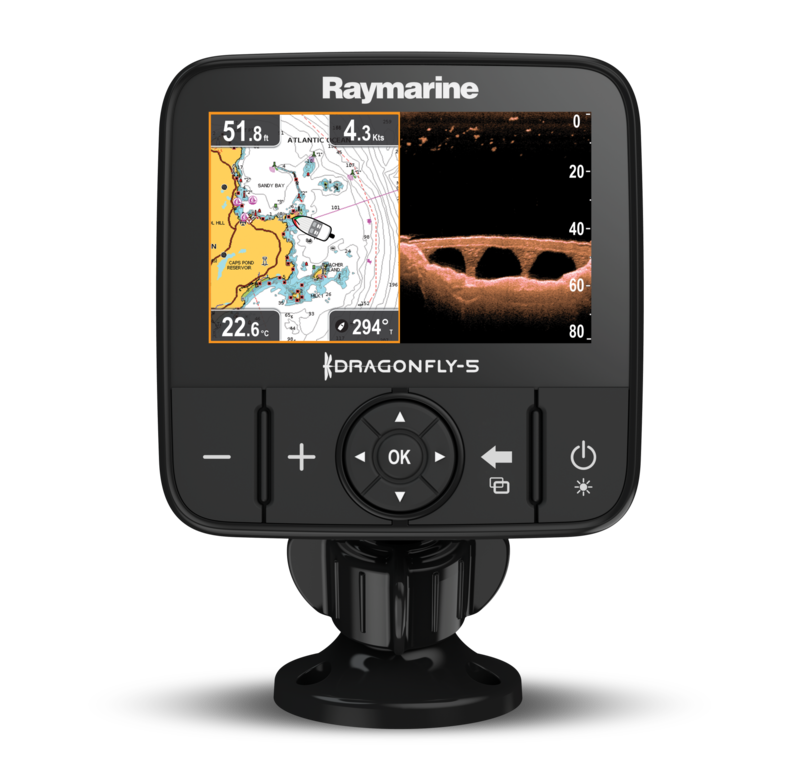 The starting price of the Raymarine Dragonfly 5PRO is as affordable as other products that offer far less technology, no streaming capabilities, smaller displays or even no mapping features. Many people love the tablet look of the screen and certainly most anglers will enjoy the high resolution. The screen is bright, easy to read and well built. It’s also handy that Raymarine guarantees against fogging so if you’re fishing in the rain or on a cold day, your unit is still going to work for you. The Dragonfly series comes in 4, 5 and 7 versions (The Dragonfly 6 has been discontinued). Each of these units relates to the diagonal screen size. All Dragonfly 5 units come with a 5” 800 x 480 pixel display resolution. However, the lettering behind the screen size carries very important distinctions. The Dragonfly 5DVS features dual CHIRP and DownVision sonar, but no mapping or GPS. The Dragonfly 5M adds the GPS and mapping to the unit. Finally the Raymarine Dragonfly 5PRO has all the features of the 5M, plus WIFI. The Dragonfly 7PRO is a comparable product to the 5PRO from the same company. The display is two inches larger on the 7PRO, making it the largest display in the Dragonfly line. The unit is also brighter and offers an excellent sonar coupled with DownVision CHIRP technology. This makes it easy to spot fish and gives a clearer picture of bottom structure. The 7PRO starts at a higher price point but generally is not that much more expensive than the 5PRO. If you want a larger screen, the 7PRO might be the option for you. The Lowrance HOOK-5 was included here as competition because of its lower price point. The unit is an improvement on the popular Elite-5 HDI. The HOOK-5 is simpler and easier to use and does come with a 5-inch display screen though some people find it grainy and not as clear or easy to read as the 5PRO. Similar to the 5PRO it uses CHIRP and DownVision technology and can see to a depth of 1000 feet while the 5PRO’s maximum depth is 600 feet. It comes with Insight Genesis custom mapping software that uses GPS to chart your location. While some bodies of water won’t be compatible with the software you can buy an SD card that is compatible with Navionics and other mapping technology. The product itself is more rugged looking. It looks far more like a fish finder and less like a tablet than the 5PRO and similar finders. The HOOK-5 doesn’t have WIFI. 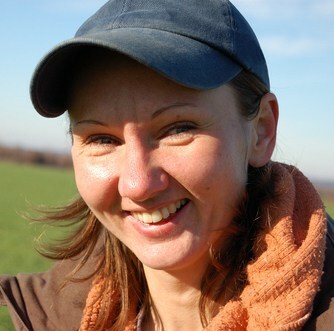 Some people have found that the unit has problems after sitting for a season, is harder to install or won’t power up while other users have loved the unit and experienced none of these issues. This Garmin Echomap Chirp 73cv has a higher price point than the 5PRO, in some areas by over three hundred dollars. The screen is larger at 7 inches, but has about the same resolution and clarity as the 5PRO. The unit comes with Lakevu HD maps and has a “Quickdraw Contours” map feature and does have an SD slot for further options and add ons. The Echomap Chirp also features CHIRP technology. Some people found the unit a little complex and more suited to pro anglers than recreational fishing needs. The Humminbird HELIX 5 DI GPS is generally cheaper than the 5PRO, in some areas by as much as a couple hundred dollars. It does come with some prepackaged maps using Uni-Map. You can install an SD card that is compatible with other mapping software for more maps. The unit has no WIFI. It does have a 5-inch screen display like the 5PRO but the screen does have a lower resolution. The unit can scan down to 350 feet but only employs down imaging technology, not CHIRP. The Raymarine Dragonfly 5PRO employs cutting edge sonar and DownVision technology to give all anglers, whether beginner or advanced, an incredible view of the world below them. The 5PRO is built well, installs easily and has a simple learning curve which means you won’t be spending days learning your equipment instead of exploring the lake. The 5” display is large and clear, even on cold or rainy days. The mapping technology, WIFI and APP capability is incredible and innovative. The unit really is an overall great package for the price point. Fishing Tech gives the Raymarine Dragonfly 5PRO an overall rating of an A.